The Euro closed relatively unchanged yesterday amid concerns related to local economic growth following comments from IMF Lagarde suggesting a downgrade of Germany's growth forecast. On a positive note, EU Consumer Confidence improved modestly in February printing -7.4 vs. -7.9 previously. But the Single Currency pulled down and erased the gains for the day as the FOMC Meeting's Minutes were less dovish than anticipated. Several FED members see further rate hikes appropriate this year. Looking ahead, we expect the volatility to continue in the markets as we have multiple economic figures due. Germany and France will release their CPI numbers, but the more relevant data will be the February Markit PMI estimates for the EU and the US. The US will also release December's Durable Goods Orders and January's Existing Home Sales. The Euro briefly broke above 1.1350 yesterday followed by a quick drop back down closing the day unchanged. 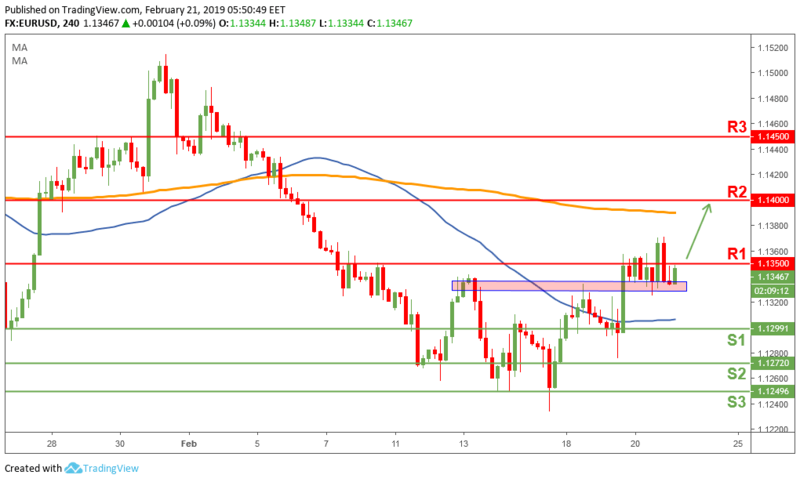 Price action remains bullish as long as the 1.1325 minor support level holds. If today the 1.1350 (R1) level is successfully broken, we could possibly see a retest of the 1.14 (R2) resistance level.